Which is funny, because this Jonathan Lavigne-developed Breakout-clone-slash-RPG is--or will be, once it's finally released--a download-only (for Xbox 360, via XBLIG) affair. Sadly, Wizorb doesn't yet have a release date. It does, however, have a rather scintillating-looking trailer, which can be viewed on Lavigne's blog, pixeltao.ca. I shouldn't have watched that trailer...now I now what I'm missing. Dang. Well, just think of it this way, Justin: There will be all sorts of great games for you to download if you eventually decide to buy a 360. This one does look awesome, though, doesn't it? Shame Jonathan doesn't put it on other services (PSN, WiiWare, 3DShop), too. Did my comment not go through? 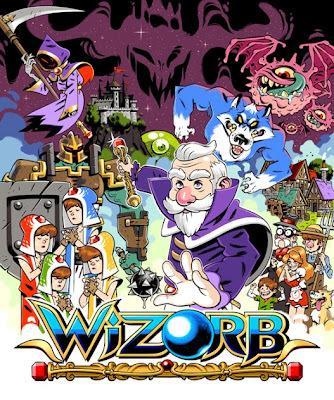 Anyway, Wizorb was mentioned to be coming to PC when it was first unveiled. With its pedigree they'd be insane not to throw it on Steam too. Thanks for the tip, coolpowers! I didn't know that (that the game is supposedly going to be released for PC, too). Hopefully you're right! I'll be getting it for the 360 myself, but it would be great if non-360 owners could play it, too. Is there a trackball controller for 360? A ball OR paddle controller, I suppose. I know there's a few "alternative" controllers for DS but I've never checked out the 360 controller market. Hmmm, I don't know, Marcus. If there isn't a paddle controller for 360, though, someone should release one in time for the release of this game :) To tell you the truth, though, I've always been fine with playing these sorts of games with a regular ol' controller. Yup, I'm sure it will play just fine with standard controllers I just have a "thing" about them. I really love to get specialized controllers haha. Like, I'm totally looking forward to this upcoming one-handed controller too (many of these already exist but this new one looks especially promising). It's just neat. Maybe I am becoming a controller collector :P.
BTW, which upcoming, one-handed controller are you talking about? Something for the 360? Speaking of which, as far as I know, ever since a PS3 firmware update last year you can't use non-licensed USB controllers/dongles. Obviously that's a horrible thing since all of these kinds of controllers already in existence stopped working :(. I never checked back in with that but I'm pretty sure it is still the case since Sony made that move to stop "hacking" dongles from functioning. That's interesting about the one-handed controller, Marcus. Thanks for sharing the link about it! As for not being able to use non-licensed USB controllers/dongles on the PS3 -- that stinks! I'd certainly be mad if I bought or owned a controller that stopped working or didn't work because of such an update.